Business case results include cash flow forecasts, financial metrics, and tactical advice for actions and investments. A compelling rationale turns business case results into business case proof. Case builders must prepare for the questions on everyone's mind: Is your proposal the best business decision? Will we really see these results? Your business case must score high in credibility, accuracy, and practical value. Reaching those objectives begins by understanding that numbers alone do not make the case. How you design, develop and write the business case are as vital as the return on investment ROI and other figures you project. Welcome to the Business Case Website! Discover here the Solution Matrix 6D Business Case Framework—known worldwide as the proven standard for business case process, structure, and content. Find here the premier resources for forecasting business outcomes and building the rationale that "makes your case." Forecasts. The business case asks "What happens if we take this or that action?" 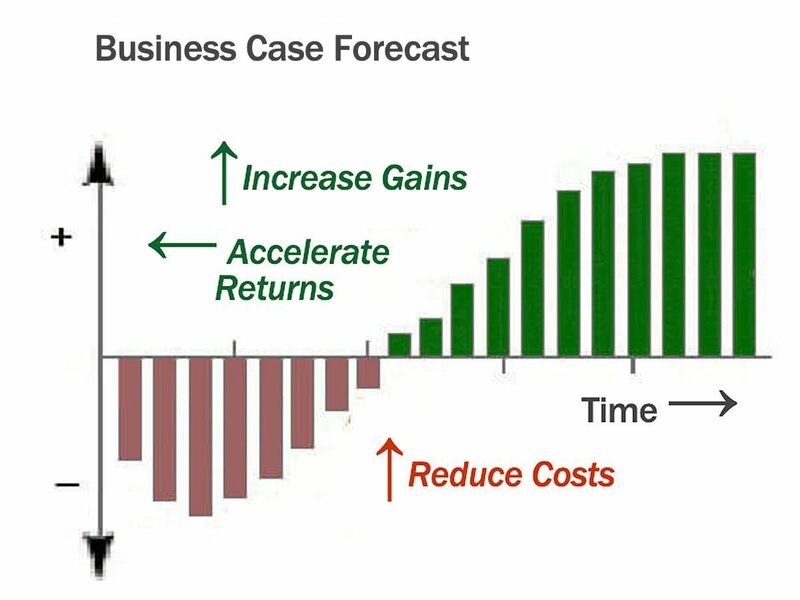 The case answers with forecasts: business costs, business benefits, and business risks. Proof. Reasoning and evidence make the case for choosing one action over another. The case proves in compelling terms why the chosen action is the better business decision. Decision makers and planners rely on solid business case analysis to build the understanding and confidence they need to take action. They need credible forecasts, but they also need trustworthy proof they are choosing the best course of action. The internet today is awash with books, training, and templates promising to help you answer the "What happens?" question. Most provide little more than a few cost and revenue forecasts for your proposed action or investment. Know that forecasts alone are not a business case! To achieve credibility, accuracy, and practical value in real-world business, your case must deliver clear answers to other questions as well: Is funding your proposal a good business decision? Will we really see these results? Can we expect significant non-financial impacts? And, which risks should we know about? Business case proof is compelling and defensible only when case builders address all the questions. Nevertheless, most of the case-building resources available are blind to this need and cannot answer credibly. Case builder beware! In business today, real-world managers ask all the questions, and they expect answers they can trust. Our best-selling reources, Business Case Guide, Business Case Essentials, and Business Case Templates guide case builders by the same principles of evidence and reasoning that bring decisive proof in the courtroom and the science lab. The Solution Matrix 6D Business Case Framework is unique and proven highly successful. Astute professionals worldwide are meeting the full range of real-world business case needs with 6D resources found here. When Must You Deliver a Business Case? Businesspeople everywhere are finding that business case results are now mandatory for decision support and planning throughout the organization. Business case questions are center stage strategic planning, project management, asset lifecycle management, capital spending, product management, sales, marketing, and IT support. Can you support your proposal with robust cost-benefit analysis? Please make the case that funding your plan is a sound business decision! Which strategic objectives deserve high priority? How do we set realistic targets? The Project Management Office wants financial justification for all proposals! How do we measure return on investment for products? For marketing programs? The Capital Committee wants Total Ownership Cost figures before spending. How Do You Build a Business Case? You may be facing such questions for the first time and have little or no background in finance and planning. Or, you may have extensive experience in these areas, yet still need to get up to speed on what belongs in your business case, how to write the case, and how to "make" the case with a compelling presentation. Step-by-step guidance and time-saving resources including the best selling books, Business Case Essentials and The Business Case Guide, professional-grade templates and spreadsheet software to guide you through the financial math. Open seminars in London, New York City, and Washington DC. For those with immediate decision support and planning needs, we offer the 6D Business Case Solution. 6D case-building projects deliver the highest quality results in the shortest possible time. The Solution Matrix 6D Framework™ draws upon our 20+ years of experience with a wide range of industries and business issues. Companies and governments worldwide recognize the 6D Framework as the business case standard. How long before a new ERP system pays for itself? How do we put our capital review process into a business case framework? Is the business profitable for all partners in the proposed alliance? Are risks and rewards shared equally between partners? We look forward to hearing from you to discuss your own case building needs.